TRX Suspension Anchor allows you to hook up your Suspension Trainer anywhere you train, whether indoors or outside. The Suspension Anchor enables a full range of motion, just wrap it around an overhead anchor point and clip any Suspension Trainer to the bottom loop to start training. Can be used with or without TRX Xtender. The Suspension Anchor is adjustable and accommodates anchor heights of 7-9 feet. 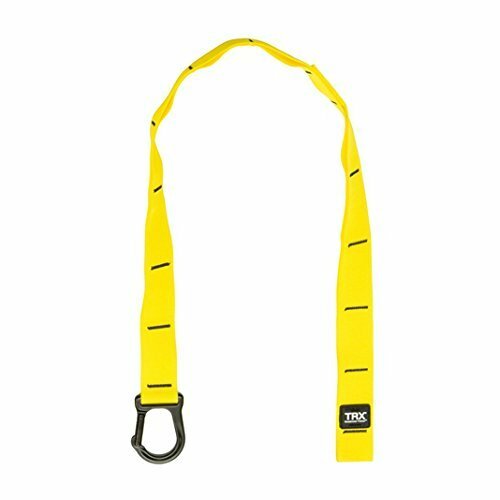 HOOK UP YOUR SUSPENSION TRAINER ANYWHERE: TRX Suspension Anchor allows you to hang your straps off bars, poles, hooks- pretty much anything you find that will take your weight. Clip on your straps and you're ready to workout. ENABLES A FULL RANGE OF MOTION: The Suspension Anchor enables a full range of motion, just wrap it around an overhead anchor point and clip any Suspension Trainer to the bottom loop to start training. EASY TO SET UP AND USE: TRX Suspension Anchor allows you to hook up your Suspension Trainer anywhere you train, whether indoors or outside. Simply hang your anchor, clip on your straps and you're ready to workout. ADJUSTABLE FOR VERSATILE USE: The Suspension Anchor is adjustable and accommodates anchor heights of 7-9 feet. It can be used with or without TRX Xtender. THE TRX MANIFESTO: As the leaders in functional training, we aim to empower you in your pursuit of better. We've developed the world's best training equipment, workout programs, and education courses to help you achieve a better version of yourself. If you have any questions about this product by TRX, contact us by completing and submitting the form below. If you are looking for a specif part number, please include it with your message.